I struggled with this CD in spite of the excellent performances. It appears to me disjointed, bitty and lacking a sense of balance and direction. A brief glance at the list of works given above and their respective timings will explain what I mean. The CD opens with an arrangement of ‘Hark! The Herald Angels Sing’ by (possibly) Charles Burney. This is followed by an instrumental Welsh folksong played on ‘Welsh harp’ which is such a contrast to the hymn. I am not convinced it works. I found it difficult having Peter Maxwell Davies’ fine carols juxtaposed with plainchant from the Nuns of Chester. Not that either is unpalatable: it is just that I would rather hear Davies on his own terms and not sandwiched between much earlier musical styles. Equally unsettling for me was the edgy, but thoroughly enjoyable, ‘Illuminare, Jerusalem’ by Judith Weir interposed between an English and an Irish traditional folk tune both played as instrumentals. I understand that the ‘concept’ of the album is to present medieval lyrics in an original and modern guise. However, I feel that, for example, the three efforts by John Jacob Niles (1892-1980) seem to be pastiche rather than a genuine attempt at creating a medieval sound-world. His ‘Sing We the Virgin Mary’, ‘I wander as I wander’ and his ‘Lullay, Thou Tiny Child’ are childish rather than primitive. There is a flawless folk-song arrangement by Ralph Vaughan Williams which bears many hearings but why is this magical mood spoilt by the following piece for fiddle and concertina, which is great, but seems to be out of place here. This tap-room music is itself followed by a short burst of plainsong, ‘Hodie Christus Natus Est’ which is beautifully presented. After this comes a gorgeous carol by Holst ‘Jesu, Thou the Virgin Born.’ It is all very confusing and inconsistent. On more secure ground are the well-known numbers from Benjamin Britten’s Ceremony of Carols including ‘There is no rose’ and ‘As Dew in Aprille.’ Listen to these separately. The disc ends encouragingly with the well-known words by Charles Wesley and John Cennock ‘Lo! He comes with clouds descending’ to the equally popular tune by Martin Niles. The CD is nicely presented. The texts of all the pieces are included in the liner-notes. 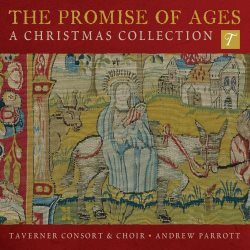 The performance by the Taverner Consort with their director Andrew Parrott of these diverse pieces of music is typically superb and often quite moving. The sound is excellent and crystal clear throughout. I note that all the pieces were recorded in 1998 so they may have been selected from a larger collection of tracks. I guess that I would rather that the producers of this disc had decided to stick to either standard Christmas carols and anthems, plainsong or folk music. The current programme sounds like a compilation created by having a multi-disc CD player on ‘random’. The mixture is unsatisfying and one is left wondering why a pop tune such as ‘Gaudete’ by the electric folk-group Steeleye Span was not included for good measure. After all this too is based on a medieval text. I do wonder if anyone will actually listen to this CD from end to end. I certainly found it extremely difficult to take as a whole. However, individually it has a number of excellent pieces which deserve exploration and if you like the extremes of variety in this repertoire it should appeal.